Subscribe to Get Blogs in Your Inbox! While we receive plenty of calls to service residents and commercial business owners in Upstate, SC, we answer a lot calls on drain clogs, too. Even at Ken's, we can EASILY attest to how annoying these clogs are, and many fall prey to having a tub drain clogged without realizing it until they're already taking a shower. In order to prevent this from happening in the future, take a look at some of our tips on keeping your sink or tub unclogged. Place mesh screens over all of the drains, specifically your bathtub and shower drains, but it works in the kitchen, too. This will catch hair, food, and any other debris from getting into your drains and clogging them up every other month or so. These can be found at your local hardware store and are the most effective option you can do to maintain clog-free drains. Chances are your daughter's bathtub clogs up more quickly than your son's, or that's what we hear a lot. If you remind your kids to brush their hair immediately before showering or taking a bath, this will help remove the majority of loose hair. This way, hair is caught in a brush and later disposed of in the trash rather than down a drain. This may be difficult to do if you've always bathed your pet inside, but try to wash pets outside in the warmer months to prevent their dog hair from getting down the drain. 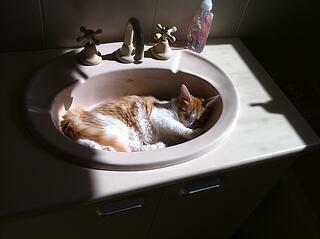 During the winter months if you wish to bathe your pets inside, it's best to place a wash cloth over the drain. We have always suggested to our customers to buy a large washtub and bathe pets in the laundry room as opposed to a shower. That way all dog hair is cleaned out of a washtub instead of down your drains. Take 1/2 cup of baking soda, 1 cup vinegar, and 2 quarts of boiling water, and pour the baking soda into the drain. Baking soda is a great cleaning agent and has been a home remedy for decades. Then add the vinegar and let it sit for a half hour. Vinegar contains acetic acid that is one of the best solvents when it comes to cleaning buildup in pipes. After thirty minutes, take the 2 quarts of boiling water and pour it slowly down the drain. We love hearing from customers, so if you've tried these tips and still have trouble with clogged drains, feel free to give us a ring! We will be glad to walk you through some other tips to straighten the problem out or come see what's going on ourselves. Give us a call today at (864)-242-5511 or click the banner below to schedule a service. © 2015 Ken's Plumbing, Inc. All Rights Reserved.